Think beyond the dress this party season, and turn to the update-to-know-now -- statement pants. A ruffle-hem dress pant equals forward-thinking glamour, which basically means it's stylish AND effortless -- aka two of my favorite things! 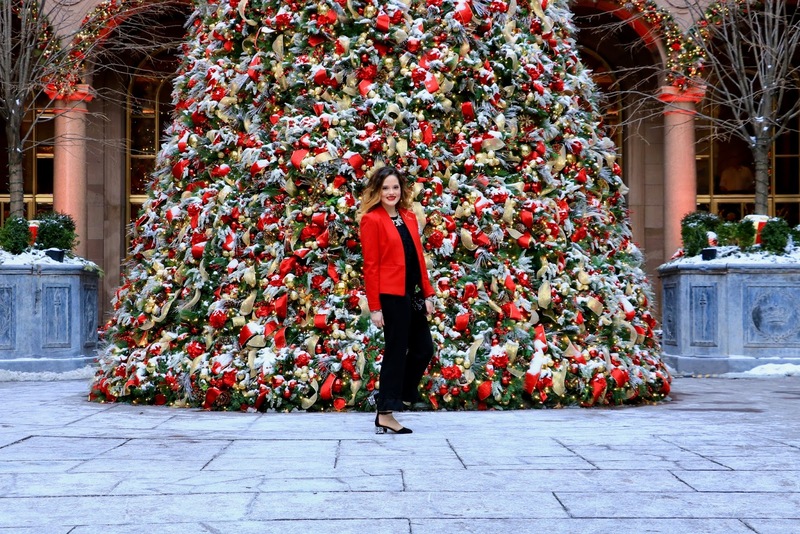 This festive outfit is SO fun and easy to wear. 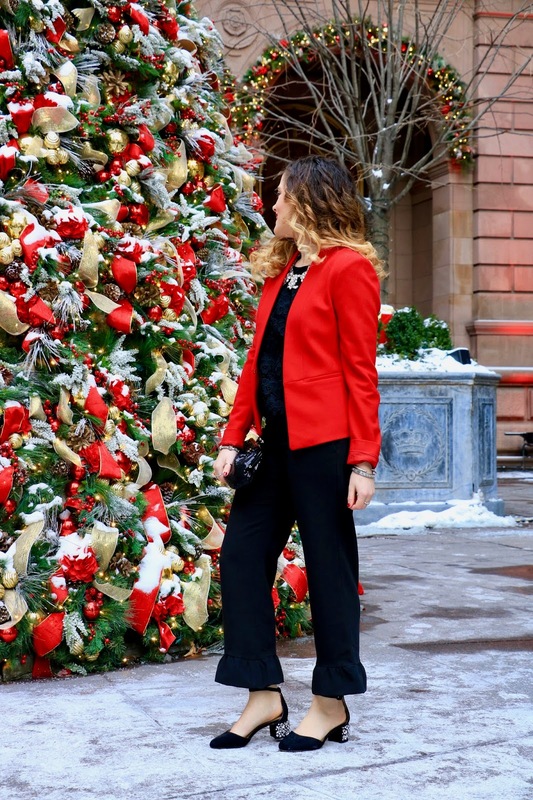 I've been super into pants this season, and it's a lot easier than you think to incorporate them into dressy looks for the holidays. Add a bright jacket or blazer like I did, and don't forget some type of bold shoe. This pair features an embellished block heel that I'm obsessed with. You know me, sparkly accessories are my thing -- especially during Christmastime! I've had this sequin black clutch forever -- my mom gave it to me in middle school after she had already owned it for a couple of years. It's one of those purses I break out for special occasions. 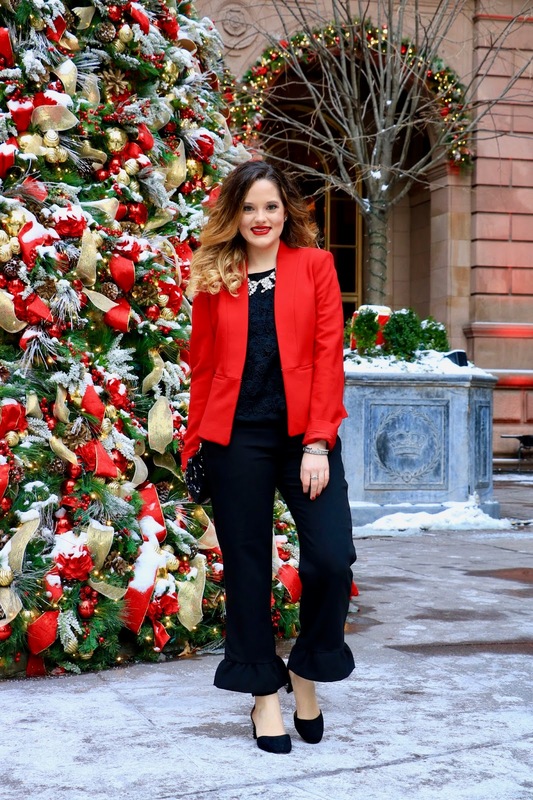 I love how it compliments my makeshift festive pantsuit! The Lotte New York Palace Hotel Christmas tree is pretty famous here in NYC. While the Rockefeller Center tree is a big tourist destination, this attraction is just as magical and beautiful, but a bit lesser known. And for all of my fellow Gossip Girl lovers, yes, this courtyard should look familiar. This hotel is where Serena and her family lived during season 1, and the cast actually filmed here!